Fancy something fun & different for your wedding day transport? This 1966 VW Beetle is a replica Herbie based on the Disney series of films including The Love Bug & Herbie Rides Again. 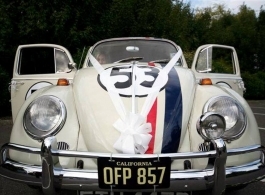 Herbie can also be hired for corporate events, TV shows, promotions, charity events, grand openings, public appearances and almost any other conceivable reason why you would want a car to stand out from the crowd. This car is based in Winchester and will also cover Southampton, Portsmouth, Basingstoke, Reading, London and most places in the South of England.